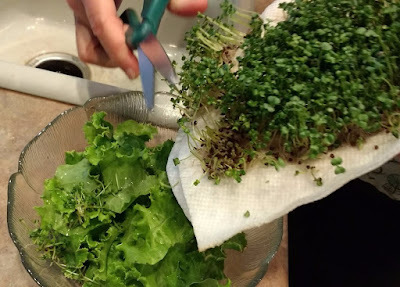 I planted a tray of broccoli seeds six days ago and we harvested our broccoli microgreens into the salad that we had for dinner this evening. I then misted the seeds with a spray of hydrogen peroxide (less than $1 at Walmart) to kill off any pathogens that might have attached themselves to the seeds along the way. After the one time application of hydrogen peroxide I misted the spread of seeds on the towels with water -- but not so much as to soak the towels. I just wanted to keep them mildly damp. I then covered the container so that the seeds were in darkness and continued to mist every 5 or 6 hours. Because the humidity is so low here in the Arizona desert, extensive misting is necessary. People living in more humid places might be able to mist just a few times a day. 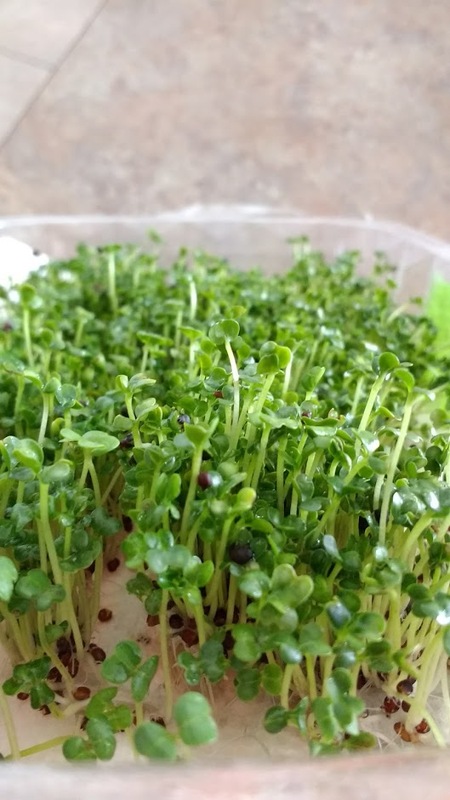 After two days the seeds had started to sprout and I removed the dark covering. I then left the tray out in the open, uncovered, and throughout the days continued to mist with water as before. I have added nothing to the water -- no nutrients or fertilizer. And while the tray is sitting next to some plants with grow lights over them, the broccoli is only benefiting from that indirectly. Most of the light is natural sunlight coming in through the window. Harvesting requires a pair of sharp scissors. This is a really inexpensive and simple way to add some nutritious and tasty greens to the diet. 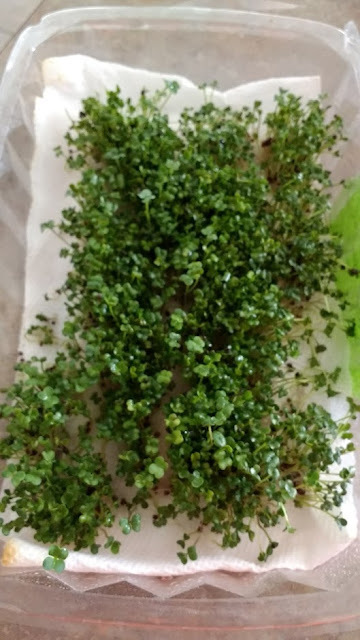 I'm told that the microgreens are more nutritious than if I were to plant in the soil and allow the plants to mature. But I don't know if that is true. Many people are farming microgreens from home to sell to high-end restaurants. I'm not one of them. I'm interested in gardening methods for people without a lot of cash. Of course, if they sell microgreens to restaurants they may become flush with cash but others have developed that model.